Check out below what BWI Sanitation can do for you! We specialize in helping homeowners, contractors, builders, and business owners rent Roll-Off Dumpsters. 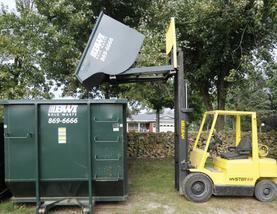 With BWI Sanitation, finding Roll-Off Dumpsters for rent is simple, reliable, and affordable. Why rent a dumpster from a locally owned company? Homeowners, contractors, builders, and business owners that need to rent Roll-Off Dumpsters have many options for their roll-off rentals. You can make one easy phone call when you deal with BWI Sanitation. No lengthy online forms to fill out, no middleman taking your Roll-Off Dumpster order. Speaking directly with BWI Sanitation means fewer miscommunications, less time and hassle for you, and we'll help you decide on the right size dumpster for your job and give you a price quote up front. The quality of dumpster service can suffer when you use a large, national dumpster service. Since national services are located somewhere other than your hometown. The end result is often more red tape, frustrating service delays, and higher prices. You'll find a local owner more helpful than an operator 1000 miles away. BWI Sanitation is a locally owned dumpster company that answers our own phones and processes our own dumpster requests. That keeps your life simple and can save you time, hassle, and money when renting a dumpster. For simplicity, reliability, and affordability, "go local" with BWI Sanitation. Why are they called "Roll-Off Dumpsters?" If you're a homeowner and renting dumpsters for the first time, you may be wondering why they are often referred to as "Roll-Off Dumpsters." The term comes from the way they are off-loaded from the truck... they "roll off" the back of the truck. These Roll-Off Dumpsters actually go by many names, including driveway dumpsters, waste dumpsters, trash, rubbish, construction, garbage, refuse, yard waste dumpsters... and more. What size dumpster do you need for your job? A 20 yard dumpster holds 20 cubic yards of waste. Common dumpster dimensions for a 20 yard dumpster is: 8 ft. wide by 23 ft. long by 4 ft. high, or about 6 pickup truck beds. A 30 yard dumpster holds 30 cubic yards of waste. Common dumpster dimensions for a 30 yard dumpster is: 8 ft. wide by 23 ft. long by 6 ft. high, or about 9 pickup truck beds. A 40 yard dumpster holds 40 cubic yards of waste. Common dumpster dimensions for a 40 yard dumpster is: 8 ft. wide by 23 ft. long by 8 ft. high, or about 12 pickup truck beds. Give us a call today, and we'll be glad to help you choose the right dumpster to meet your needs! Everyone is moved when they hear the news that disaster has befallen a community. Earthquakes, floods, hurricanes, tornadoes can suddenly change the lifestyle of a family, a community and a country. BWI Sanitation is here to assist in the removal of debris during the aftermath.